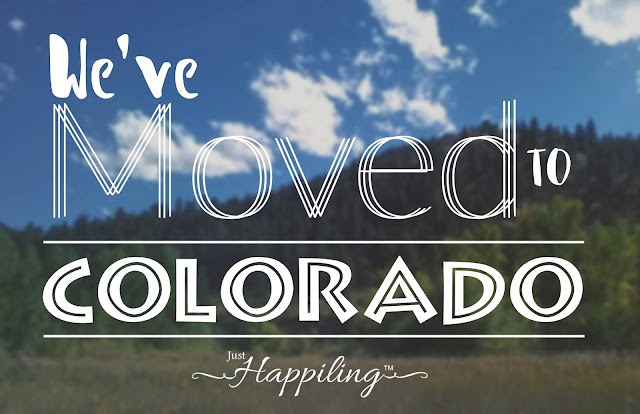 It's been quite a process, but we've finally moved! The reason why I sound so excited about it, is because we were never really considering staying in California for as long as we did. When we were all packed in the car and ready to leave, I felt like we were finally moving forward with our original plan of life. Come join me in this blog post, as I share this journey, and what worked for us on a tight budget to be able to just do it--Colorado.here.we.come! California is a beautiful state, however, I never really felt like it was a place I wanted to live in on the long run. Don't get me wrong. I love California, from a tourist perspective. However, I didn't really feel comfortable living there. I remember when I used to visit my now husband, back when we were just dating, and I kept on mentioning that it just felt like "the twilight zone". It was strange. I just didn't know if it was the time zone, or the weather. It just didn't feel that appealing to me. Regardless of that, I really enjoyed visiting all the touristic places, and the fact that it was very close to the border so that I could keep connected with my family in Mexico (even if they were on the East Coast). As we talked about our life plans, we would constantly mention that we would only stay in California for about two years, and then move somewhere else; that was back in 2008-2009. I was leaning towards anywhere that was cold, so Canada was always a card on the table. I have a few friends that live in Canada, and many who have gone to study both English and French, and they all highly recommended it. However, the distance wasn't as close to Mexico, as actually being on the next door border, and that had me a little indecisive. Still, we really wanted to build an organic farm, and Canada seemed to be the best choice for that at the time. Like with everything in life, plans changed due to unexpected circumstances, and we just had to go with the flow. Our plans stayed the same "Organic Farming or Burst", however, for the time being we had to do it very, very small scale, due to lack of space and Home Owner's Association rules. We didn't know for sure how long we were going to have to stay in SoCal, but we knew we had to do the most out of it, so we took that time to learn as much as we could about growing our own food, organic practices, and healing the soil. We also took advantage of that time and went back to school in order to be better prepared for whatever came our way. I think this was what made me feel a bit more connected to SoCal, because I wasn't really feeling it prior to that. We lived in that house for almost 9 years and I was never really comfortable enough to call it home. I guess not having many friends also contributed for me to never really connect with it. Early when I first moved there, I had chosen not to make friends, because the idea was that we were not going to live there for long. When those plans ended up in "stand by" mode, I chose to get involved with my community by volunteering at the closest hospital, which was in a way, related to what I was going to school for. However, it just seemed that people came and went so quickly, that a good lasting friendship wasn't really in the picture. This made me realize that what I really had to do, was focus on how to make our life plans come to a realization. I kept on trying to figure out how to attract the lifestyle that we so eagerly wanted. I am not going to lie. Between the HOA's restrictions and the little space we had, had us very frustrated; it was not easy. However, try telling that to your OCD brain, haha. As you can see in the picture above, we grew a bunch of things. Although this picture was taken a month before we moved, and our front yard didn't looked as crammed all the time, we did grow a lot of things. Some of these plants were in the balcony, and the rest in the front yard. We chose to grow fruit trees that we could keep small, annuals, greens, and flowers to attract beneficial insects. I can easily say that for the past 5 years, we really got into working the soil, so that our plants would be as healthy and lush as they possibly could, because it wasn't just a hobby; this was going to be our livelihood. We had to do it right from the start. Ideally we wanted to move to Colorado with all of our plants. However, last year, we realized that we were on a very tight budget and this plan was not going to be a possibility. Even at the end, we literally had to leave some of the plants we were bringing with us, behind; it was very sad. In fact, we were planning to move last year, but again, unforeseen situations that made us have to stay an extra year in SoCal, and we just had to deal with it. It turned out to be a very hard year, because we couldn't grow anything. We were moving, that was a fact, so growing anything seemed pointless, because we didn't know for sure when we'd be moving and it seemed that we would miss on the crop. Not growing any food for a whole year hit us hard. We were depressed. We still had a few plants in the house, but most of them were non-edible flowers and fruit trees that were either too young, or took too long to give fruit. Our garden felt like only decor, and not what it was really intended to be. The only thing that kept us hopeful, was the idea that once we moved, we were going to have so much space to grow all the things we've been wanting to grow and much more. But where were we moving? Ah, well I'm getting there shortly. These lovely Tropicana roses, were some of the plants we had to leave behind. It was hard, because this was one of our wedding flowers. Meaning, we got these as a gift to ourselves a little after we got married, so, they were important to us. However, we know they are in good hands and that they will be loved by our very good friend and neighbor, who also ended up with a wonderful bounty of plants. I know she will enjoy them, because we shared the passion of growing plants, and she really has a green thumb for it. Once we knew exactly when we were going to move, it was easier to plan, and we were able to grow something to enjoy before the move. Therefore, last winter, we grew this patch of lettuce, and enjoyed it until before we moved. The picture below shows the last flush before we harvested and got rid of the planter. Packing was crazy. This was the first time I was going to do a big move, and it really required planning. I didn't know much about moving a two bedroom house, but I thought it couldn't be that hard. Just put a bunch of things in boxes, tag them, and you're done; I was wrong. The good thing is that I started packing last year, and still, we had to delay our trip for two days in which I had no sleep at all, because I just kept on going and going. I have to confess that those two extra days were not enough either. Because both my husband and I were working, we could only pack on our free time. Planning was very important and I think key to getting this done right. However, I wasn't really expecting for us to have so many things to do and pack. Then again, after living in a house for almost 9 years, 20 for my husband, you kind of gather a bunch of stuff. So if I could give you an advice, start getting rid of stuff room by room as early as you can. It is always easier to pack if you know what you are taking with you and what you are not. I started packing all the things that I knew we were not going to use in the following 6 months, and maybe even a year. This made it easier. I started with my personal belongings, because it was easier for me to take decisions over my stuff. Clothes, collectibles, books, and all of those things that I knew were not going to be needed. Then, I continued with all the figurines and decor in the living room. I alternated with things in our garage, and some of the empty planters in our front yard. This last was the hardest, because they were heavy and full of dirt. It was good organic dirt, but still, very heavy to carry. I had to discard this in parts and give away some of our precious soil to our gardening neighbors. Then I started planning on re-homing the plants and trees we were not going to take with us. The good thing was that we had quite an interesting collection of trees, so within two weeks, they were all gone. Getting a quote from a moving company was tricky, because you need to have an idea of how many boxes of which sizes you have, with the purpose of getting a more accurate quote. Our problem was that our budget was super tight, due to medical bills from both of us and our cats, and I wasn't even close to finishing packing, to have an idea of how many boxes I had. I just couldn't even get an idea on the number of boxes we were going to end up with at the end, to be as close as possible with the numbers, and then have enough time to save that money. I was not seeing the light at the end of the tunnel on this one. I must confess I got a little scared that we would have to wait another year to move at this point, especially after one of our cats got sick again. Like I said, life just keeps on throwing some hard ones at you sometimes. You see, in the past few years, living in California started turning quite expensive for us, considering that we needed to keep a 100% organic or at least non-gmo diet, plus the medical expenses we were all having, including the cast. Added to that, for some strange reason, we were developing allergies that we didn't have before, and some other health issues that required us to have a change in environment. The matter of fact was that, we just couldn't afford to continue living in California. Of course it wasn't all bad. This situation totally encouraged us to figure out how to go back and retake our original farming plans. Living in California was like a test. It helped us better ourselves, and gave us time to truly plan what we wanted out of life. We learned a lot about our personalities, about our bodies, and about our goals. But that experience was always meant to be temporary, so we really had to let it go, in order to move forward in life. Otherwise, it was starting to feel like if we were stuck there with no reason to be, and that my friends, is no way to live. Three years ago, my mother-in-law invited us to Colorado, to visit her. It was my first time visiting, and I fell in love with the state right away. Although we loved the idea of moving to Canada, Colorado was starting to look like a great idea. To my surprise, the environment was very similar to my hometown of Monterrey, Mexico. Therefore, I felt it would make it easier for my body to adapt to the change. You see, my body never really adapted to the weather in California, however, Colorado had a more familiar weather and environment, making me feel like I could kiss all of those migraines goodbye. It was so amusing to compare all the similarities Colorado had, with my birthstate Nuevo Leon, Mexico. But mostly with the area of San Pedro, where I grew up in. It suspect that the reason for this, is because we share the Sierra Madre Mountains. And although we have some differences like the main language spoken, and the colder winters, I think I can manage. After all, I always wanted to live where it snows. Another reason we chose to move to Colorado was to be close to family. My mother has my brother back in Mexico. My father-in-law has his wife and my brother and sister-in-law. However, my mother-in-law, technically lived by herself--it was a no brainier. We loved the idea of living in Colorado to raise our kids, and we definitely agree that children should grow up around at least one grandparent, so in a way, it was going to be a win-win-win for everyone. Plus it totally worked as a place were we could continue on our path, trying to build an organic farm. I think that many of my friends and relatives were very happy with this idea. Let's just put it this way, I already had loads of my friends back in Mexico, who wanted to come and visit. The funny thing was that we hadn't even moved yet, and they were already making plans to get there, haha. It was hilarious! Then again, Colorado is a very popular touristic place for people in my region, so it did make sense. Honestly, I didn't mind at all, because that meant they could pay for their stay in delicious dulce de leche candy from my region, because my husband loves it. It was settled then, Colorado was going to be our new home. But the question now was, how do we get there? As mentioned before, California was becoming too expensive. Saving for a move was looking like a very stressful budgeting plan. We tried saving as much money as we could last year, when we originally had planned to move. But you can't ever really foresee the expenses that can suddenly cripple your budget. So we had to think about an alternative plan. I had to continue with the packing, because without knowing how many boxes we had, we couldn't really make any kind of decision. I researched moving companies, I researched moving trucks that we could drive ourselves. I researched shipping container-like services, until finally, we decided to rent a storage unit, leaving most of our stuff behind for a while. As things were, we were just praying that we didn't have any other medical emergencies of any sort, so that we wouldn't have to continue stuck where we were. The reason why I say "stuck" is because it literally felt that way. It felt like we just couldn't move forward in any direction. We couldn't save money to buy a property with big enough land to farm, and our window to have children is narrowing down with every passing year. Plus, living a healthy lifestyle was starting to look more like a luxury, which is wrong in so many ways. It was a very hard decision to leave our things behind in a storage unit. Many of our things are special to us. We love cooking and creating art, and most of those things had to stay behind. Still, we were determined to leave no mater if we had to load the cats to the car and just go with the clothes we were wearing. Yeah, I know that sounds quite drastic, but that's how desperate we were to get out SoCal. We were desperate to grow our own food, to breath fresh air, to feel some sense of security, to have some peace of mind, and most definitely, we needed a change of scenery. Health-wise, we realized that we became allergic to palm tree pollen. You can only imagine how uncomfortable it was to be living in a place surrounded by allergens 24/7. This was another reason to leave. We packed the things that truly mattered to us. We sold some of the things that were replaceable, including furniture, some of our collectibles, and our trees. Little by little, it all started to look like we were right on track. However, the last month was the hardest. I would wake up around 3:00 am with worries about not finishing on time, or planning the chores for the day. I would start working around 6:00 am doing my normal chores before going to work, then I would go work, and upon my return, either continue packing, or cleaning, or something related to the move. The last two weeks before we moved were insane. I was working non-stop, and I honestly didn't want to burden my husband with carrying things and moving around, because I didn't want him to get injured before the trip. I figured, well, I'm not the one who will be driving, so better me than him. He did helped me a lot, but he almost didn't have any free time, as he was trying to work as much over-time as possible, while also trying to overcome a very long-lasting cold. It was a good thing I believe, that I was able to manage and carry most of the boxes, and I will tell you why. I had read that sometimes moving companies change their quotes and want to charge you more if a box happens to be heavier than what they believed it was. However, since I literally moved every single box by myself about three times (from the garage, into the house, and back to the garage), the moving company won't have any excuses on having their employees move the boxes, especially if it is two people at the time. I made sure that they were all of a considerable weight, to avoid any complains. I believe there was only one box I needed help with, and mostly because it was very bulky. So all in all, it was a good experience and definitely an intense workout. On the bright side, I lost quite a bit of weight, and much got done. Both our cats were getting a little bit nervous, because they didn't know what was going on, and the house was starting to look very empty. Not quite there, but it did look different from what they were used to. We just hoped to keep them entertained enough for them not to notice that we were going to move, because they certainly hate being in their crates. Can only imagine what a 16-hour trip was going to be like? Yikes! On this subject, we planned this trip to be a three-day trip, in order for all of us to travel as rested as possible. Obviously for me it was a bit harder, because by the time we actually got ourselves in the car and said our last goodbyes to our house in California, I was completely exhausted. My thoughts were foggy, and for the most part, I had stayed awake for the previous 48-hours. Not healthy at all. I think I only slept about 3 hours during those 48 previous hours. I just had this sense that I was not going to finish cleaning and clearing the house. I couldn't believe how it seemed that the work was just never ending. We tried to leave the house empty, but we just failed. We donated a lot of things, there was a lot of trash too. I don't even know where it just kept on coming out from. It seemed that whenever I thought we were done, there was another corner of the house that I hadn't looked at, due to being so stressed and tired, and I was still clearing drawers out a few hours after leaving. It was crazy! I thought I had planned it out accordingly, but I guess I didn't. Sometimes you just have to try your hardest and then just hope for the best. See the photo above? That was our sage plant, a couple of days before we left. Since we had gotten rid of all the plants and trees that attracted beneficial insects, the pests came in. This is how significant the change was in our front yard. We wanted to leave the house bare, so that the next owner had a blank canvas to work with. Although, we did leave this sage, a rosemary, and a dwarf banana tree. It was shocking for me to see, how in just a few days of not having beneficial insects around due to he lack of plants, the bad guys came to claim the territory. So my advice to you fellow garden lovers is; feed your beneficial insects. They will save your garden. Loads of flowers that bloom early will attract them. Don't worry if they also attract some aphids, as they will turn into lunch lunch soon after. We had a very controlled organic environment in our small garden thanks to encouraging beneficial insects, and we hardly needed to use any form of pest control. It was a good learning experience that we intend to incorporate to our new garden. Ready, doors closed, sit-belts on, let's go! Our plan was to drive the first day about 6 hours, traveling from Escondido, California to St. George, Utah. I literally cried when we crossed the state lines, leaving California behind. Again, I have nothing against this beautiful state. It just never felt like home for me, and being sick all the time wasn't helping the cause. It was exciting when we drove by Las Vegas, Nevada. I had never been there before, and although this was just a drive-by, it was fun to see all the Hotels I was familiar with, from my time working in an airline. One of the flights I most commonly documented passengers in, was the flight to Las Vegas, and I was familiar with all these high-end hotels. I just never had the pleasure of visiting them before, only appreciating some of them via my friend's photos and a few popular Hollywood movies. Maybe I'll get a chance to go see Ricky Martin in concert at some point. Now that would be quite an experience! After a few delays, we got to our first destination. We felt a little closer to getting to our new home. It was very exciting. Our cats on the other hand, not so much. Another reason why we planned this trip with two stops along the way. But I will get more into detail on that matter further on. The next day, our goal was to drive about five hours and stay in Grand Junction, Colorado. The idea was that at least we would already be in our new home's state. Driving through Utah was quite a show. Although I must say that our big mistake here was not being prepared with a diverse array of music. You see, there are so many beautiful mountains along the way, which unfortunately blocked our internet signal. The radio stations became limited to two as well, none of which played anything of our interest. I knew I was forgetting something important. I just couldn't remember what it was. Oh yeah, my brain was on strike due to lack of sleep, lol. Lucky for me, I had a Michael Jackson album on my cellphone. So that is what we listened to during the last part of the trip that day. It wasn't just a trip across Utah, but also through time, haha. I have to say that I am really glad that I did remember to pack some snacks, because had I not been munching on something, I would had totally fallen asleep half way there. I just couldn't, I was the navigator. Thank goodness for technology though. Even if we lost the internet signal for most of the trip through Utah, the GPS still worked. Therefore, it wasn't that hard to follow along the road. I was so grateful for Google Maps, and I just kept on thinking on how hard it must have been for our parents, and all those people that had to carry maps around to get somewhere. Again, super grateful for technology and being able to track real-time where we were driving through real-time. It made our three-day drive, way smooth. We still got a bit lost a couple of times, but that's the beauty of Google Maps, it just re-routs you to get to where you need to be. Yes, I know sometimes it also goes crazy and wants to take you through the weirdest of routes, but for the most part, it works great. At least it worked for us the way we intended to. Ahhh (Seigh*)! You can't imagine how relieved I was to watch the sunset in the picture above. We were finally in Colorado. Not quite home yet, but we were just a few hours away. I was a little sad that we couldn't stay longer in Grand Junction though. I would had loved to visit the lavender fields I had read so much about during my research on growing lavender. The reality was that, there was no where to leave our cats or belongings for the time. Then again, that would make a great excuse to go visit during a holiday weekend some other time. For right now, we just needed to get home. I believe this is where I will mention our cats during the trip. For those of you who haven't been following for that long, we have two cats. One is a 15-year-old tabby (Mia), she is the one with the lighter gray fur coat. The other cat is a 6-year-old Bengal mix (Nahlia). Nahlia is pretty much chilled out for the most part. However, Mia totally freaks out whenever she is in her crate, because she thinks that it always means "going to the vet". This leads her to meow non-stop all the way to wherever we are traveling to. That is why, when we went to the vet to get their health certificates and get their vaccinations up-to-date, we also asked for something to keep them calm during the trip. We got some really good advice from our vet, and we were also provided with the means to get them a little sleepy through out the drive. Although Mia kept on snapping out of it on an off, it worked for the most part. I think that at some point Nahlia was the one that got the most annoyed with Mia's meows, because she just turned to the other side to try to get some sleep. I was so envious, because I too wanted to just turn away and sleep. The good thing is that aside of what we gave them, we were also traveling during late morning, which is their sleepy time anyways. So at the end, it all worked out the best way it possibly could. Traveling for more than a day with your pets can get tricky, especially if your pets are not dogs. I am so glad that I am over cautious, and that I called-in to several hotels and motels, that we were considering, ahead of time. Keep in mind that, just because it says "pet-friendly", it doesn't necessarily mean "cat-friendly". Many of these places do not allow cats in their rooms. So when in doubt, always call the hotel or motel directly first, to make sure that your particular pet is within the parameters of what is allowed by them. I called several places, within our budget, and the only place that actually accepted cats, was Motel 6. So that is where we stayed at both destinations (St. George, Utah and Grand Junction, Colorado). The stay was pretty straight forward. We made the reservations, we arrived and checked-in. Just a heads up, they ask for the id's of everyone who stays in the room, and the plates of the car you are driving. I have no particulars on the reasons for this, but hey, that's their policy and we had no issues with it. Both motels were different in the matter of service area. In Utah, there were bending machines, a coffee machine, and an area with free water and free juice options. Unlike in Colorado, where you only found vending machines for drinks and snacks. In Utah, the wifi was free, and in Colorado, we had to pay a small fee for the service. Since we were just trying to relax before our last day of travel, we didn't use much of the internet anyways, so it wasn't a big deal really. The next morning, we were more than excited to know that it was just a matter of a few hours in order to arrive to our final destination. All I wanted was to literally pass-out on the bed, and fall asleep for days. Obviously that was not going to happen, but that is what I felt I needed. Because of the cats being so stressed out in two different locations that were unknown to them, they didn't sleep well at each stop. Therefore, we didn't sleep well either. Mia was mostly the one who kept on trying to hide in the hardest places to reach her. We tried keeping them in the bathroom with their litter box set and their food and water, however, Mia was being her usual self, trying to get to "our room" in the middle of the night. I was just concerned that she was stressing the other cat out with her craziness, and I was a little embarrassed to think that they could kick us out if she got too loud, disturbing the rest of the guests. Don't get me wrong, I love Mia. She is just not very good with change, and she is kind of the "Queen of the House", making it harder to try to figure out what to do in some cases. For the most part she is pretty good, and luckily, we all made it alive, and with all parts intact, haha. As we were driving through the passages from Grand Junction, to Kittredge, Colorado, I took advantage of the dreamy scenery. I constantly had to remind myself that I was not asleep, and that this was not a dream. We were really here, and not just on vacation, this was home now. As I was looking at the majestic mountains and trees, something clicked inside. It really brought the sense of a familiar place to me; it started kicking in. We were home! It was such a beautiful day, that we kept on seeing people enjoying the different water bodies, either in kayaks, boats, and so on. It was very encouraging and inviting as future recreational experiences to look forward to, once we settled in. As soon as we got to our new home, we unpacked everything, and proceeded to build a huge cat cage that we had ordered via Amazon.com. In theory it was meant to be an outdoor cage. However, since we would be staying at my mother-in-law's place for a while, and she raises beautiful German Shepherds, we just had to make sure our cats were going to have their safe space out of the reach of big dogs that they weren't used to. After all, they've only been exposed to dogs for a very limited amount of time. If you want to read our review and experience regarding putting this cage together, stay tuned for an upcoming blog post, where I'll share all about it. At this point, I would say that after a couple of hours putting the cat cage together, and setting ourselves in, the bed was definitely calling out my name. The next morning, we just couldn't wait to start doing our thing; planting. However, we also needed to get some supplies. Therefore, we headed out to the local farmer's market to see what goodies we could find. I think we got a really sweet deal with a huge bag of organic cherries, and locally grown honey. Now, I am not a scientist, nor do I claim to have the absolute truth. However, my grandmother used to say that honey was very good for your immune system, so whenever we had a cold, honey and lime were our "grandma's remedy". For the most part, it always worked! At least for us. Still, when we've read about the properties of honey, we've always bumped with the same information; which mainly suggests that because local honey is made with the nectar from flowers that grow around the area, you are more likely to develop an immunity to certain allergies. I mean, again, we are not scientists, nor we claim that this statement is 100% accurate. However, to me, it makes sense. So, because we were moving to a new place, we totally wanted to tap into the possibility of working our immune system against allergies from the exposure to these new plants, and for us, choosing local honey is our way to go. That is one of the reasons why we bought honey at the farmer's market, and plus the gentleman selling it, also made the remark that the type of honey we got was made precisely to offer these benefits. As a matter of fact, we love honey so much, we just had to get some. To find out what kind of honey we got, and were you can find it if you live in the area of Kittredge or Evergreen, CO, just subscribe to our blog. Once the blog post with that information goes live, you'll be notified via your inbox. Isn't that great? And you know what the best part is? We never send spam! When you subscribe to our blog, you only get notifications when one of our blog posts goes live. Well, living in the mountains comes with perks. It also comes with some inconveniences as well, just like the one in the picture above. Yes, that's a deer. Apparently we have a lot of deer wondering around and eating plants in our surrounding areas. That is why, planning our edible and not so edible garden is crucial. So far, because of the German Shepherds, deer will not get into the backyard. However, there is not much growing in it at the moment, to really tempt them enough to test their limits. Needless to say, we've really been planning this for a while. I think our best bet is to try some tricks, such as; planting deer-resistant plants around crops that could lure them in, in an attempt to mask the scent and hopefully protect our plants. We've done this in the past, and it has worked with insects so far, so we are hoping that the concept works with other animals as well, not just deer. As you can see in the picture above, we've got a blank canvas to work with, which has us super excited. Of course it will need some work to get to where we were in our previous home, but nothing that can't be done in due time. Something that I've learned about gardening, is that you've got to develop a strong sense of patience. Otherwise, you need to start looking for another hobby or profession. So while we were working on figuring out where to start with the planting, we definitely knew that we needed to get our dahlia tubers and peonies in the ground. And so--we did. Both the dahlias and peonies looked great, and although we were already late with the dahlia planting, and way too early with the peonies as well. We had to just do it and work with what we had. Peonies take a few years to stabilize before giving a good crop, so with them, it's just a waiting game. However, with the dahlias, I wasn't too concerned, because we were only about a week and a half behind from other dahlia growers, and we weren't really looking to have a large flower crop this year. This year, we are mainly planning to be able to trial the dahlias, learn what varieties do well here from those we chose, increase our yield, and plan accordingly for the next year, so that we have way more crops to offer our local community. I was very sad to have to leave some of my plants behind. Still, within the space we had, we managed to bring a few with us. Among them, we brought two rose seedlings that grew by themselves in our garden back in California. We are hoping that they are a mixture of our beloved wedding roses. Another plant I was very happy we brought, was a dragon fruit cutting. This one was doing great throughout the trip. However, the day we arrived, with all the unpacking and putting the cat's cage together, I kind of forgot my cutting inside a bag and it got a little wilted and damaged. Nonetheless, something I love about plants, is their resilience. Throughout the trip, my cutting had been in a water cup, and this kept it hydrated. After I planted the dahlias and peonies, I also planted the dragon fruit. However, I have always been very unsuccessful when planting the cuttings in the ground. I am usually more successful when I just leave the cuttings on top of a pot that already contains another plant. Since this was my only dragon fruit cutting left, I was determined to save it. I planted it on a pot, and hoped for the best. Nevertheless, I wasn't counting on the sunny areas and how long it was going to be exposed to the sun, because we were not that familiar with the sun exposure here yet. It got somewhat burnt, and also very dehydrated after one day. I decided to take it out of the pot, and leave it inside for the moment. I left it on a water cup, and although it is recovering very slowly, I am super excited that it is already showing roots. I guess I didn't kill it after all, which I am totally happy about. So if potting dragon fruit cuttings on soil does not work for you right away, try placing them in water cups, and then transplanting into soil once they have long enough roots. You have to remember that although we have been growing plants for the purpose of learning organic gardening and farming for the past five years, we are no where close to being experts on the subject. We are still making mistakes, and learning from them. And we are certainly not perfect either. You see, some varieties we are growing this year, are new to us. We had mostly been growing annuals, such as; tomatoes, and peppers. We have also been growing herbs, and plants that attract pollinators. And we have also been growing a few fruit trees. However, cut flowers are new to us, and right now, we can only try our best, and hope that what we brought with us, survives as well. We are all adapting to the new environment; cats, plants, and ourselves. Nonetheless, this year, among the new varieties we are growing, we have these incredible strawberries that we got from Baker Creek Heirlooms, called Old North Sea Strawberries. When we saw them being offered online, we got inspired by the story behind them. You see, both my husband and I have viking ancestry, and these strawberries were allegedly discovered in a viking village. Therefore, we thought of them as being the perfect addition to our family garden, in which we intend to honor some of our ancestors and relatives, by planting things that they loved, or may have enjoyed in this case. All I can say is that they are doing amazing and we are super excited about them. I just can't wait to try them. What I know for sure, is that they smell delicious. Let's just hope they taste the same way as well. Unlike the Tristan strawberries that were growing fuschia flowers, back in California, the flowers of the Old North Sea strawberries are white. I'll keep you guys posted on the size and taste of the fruit once it does fruit. Just remember that if you want to catch up with all of our gardening adventures exclusively, you can just visit our youtube channel at @TheLopezGarden. Don't be discouraged if you don't see any recent videos. Remember that we just moved, and now we actually have a lot of material to cover. So stay tuned on that, and keep connected for our youtube channel relaunch soon. I just can't believe how quickly some of our seedlings started to grow. Alongside cut flowers and strawberries, we are also starting with our winter crops, since it is already mid-summer. Do you see those little seedlings in the photo above, some of those are giant cabbages, muahahaha. Let's just hope they do get that big, because if they do, that just means one thing--loads and loads of sauerkraut; my favorite, yum! Ah, hummingbirds... We placed several feeders in different areas of the porch. We just love them so much, that we want to encourage them to hang around. However, we were not expecting the hummingbird-war it was creating. Geese! These guys are so territorial. This guy in the photo below, is so temperamental, haha. He has taken the role of supervising who eats from the feeders we have placed, like if he was the master of them. We call him "Rojo"(Red in Spanish). I like to joke around saying that his temperament is turning him red. Now this guy in the photo below, has been around our porch and across the street for several days. I call him "Bucky". Should I be naming all of these wild animals? I don't know. I think it just helps me connect with the house, because it still feels very surreal to me. I am so very happy to be living here in Colorado. It has literally improved our health, and again, without doing anything drastic, we've been loosing weight too. I mean, to me that is so great, because maybe we were just being reactive to our previous environment all along. Hopefully, our health just keeps improving. I've heard somewhere, that happiness is the best medicine. It sure looks that way. Just look at this view. The picture above is what we get to see just as we go to the grocery store every other day. Whaaat? Yup, how can you not be happy when you get to see this on your way to--anywhere really? It's just beautiful. And again, don't get me wrong. I am sure there are many places that look similar in California. We just lived too far from them, and those beautiful areas in California were probably way out of our budget. I am not saying that Colorado is a cheap place to live either. All I am saying is that after researching and planning, Colorado seemed like the best choice for us, and definitely more affordable for us and our needs in the long run. Look at those clouds--clouds! I've seen more clouds in one week here, than what I saw in the whole 9 years in Escondido. I'm not kidding. Whenever they said it was going to rain in Escondido, it was always about 2 minutes of drizzling. We rarely had a strong rain that stayed there for a few hours. There was even a year where we only had rain one day out of the whole year. I was taking notes. That is crazy! But then again, it is a desert. I know that there are people that just don't like the rain. If that is you, hey, you'd probably love to live in some areas of California. But not me, I love rain. I love thunderstorms. And for farming, we need loads of water. So, like today; "Oh mighty Gods of thunder and rain and other things out there, bless our garden, and bring home good harvest!" Hahaha, I actually made a rhyme, that's funny. I think my favorite part so far, is being able to sit down at the porch, look at the clouds, hear the thunder, and watch the wildlife. Some of the birds, like the Black-billed Magpies, seen in the photo above, actually love this weather, because after the rain, the worms come out providing the birds with a feast. Such clever animals really. As long as they don't get into my flowers and our seedlings, then we are all good, haha. And just like that, after the storm--comes the bounty. I hadn't seen a rainbow in years! Now I know exactly where the pot of gold is, haha, it's right here in a little corner, behind a mountain, where I finally feel like I'm HOME. I know this post got a little long, but I also know that I hadn't been blogging in a while, because I just couldn't find something fun and happy to share with you guys. Then, I just got way overwhelmed with all the packing, cleaning, planning, traveling, and now--adjusting. However, since this is a new place for us, I think there will be loads of fun adventures and activities to share with all of you, and nothing will bring me more joy than to be able to offer quality experiences with our online community, because you've been here with us along the way, and along the path towards plans that will lead to happiness. I truly hope some of what I shared inspire you to try your best to fulfill your dreams. I know hat budgets are super tight for many of you. But if we could make it, I'm confident that you could too. I'll be here, on the other side of your screen sending you good vibes. Sharing cool and fun photos, sometimes inspiration via our social media. But furthermost, I'll be here encouraging you to take a deep breath, look at yourself in the mirror, and smile--because it's contagious and you'll find that anything is possible if your heart truly wants it, and you just keep on trying. Dislcaimer: This post is not sponsored by anyone, nor any of the companies that may have been mentioned throughout the experience shared. Any and all opinions are 100% our own. Remember that what works for our family, may not work with yours, so if we shared our experience with a particular product or service, we encourage you to read other people's opinions as well, so you can take a more informed decision before buying or acquiring such services. All the photos and information in this blog post are copyright protected and you may not copy any of the content without written consent from the author. I'm glad you've found a place where you're happy. Love the scenery! Those hummingbird pics are great. I didn't know that about local honey! Interesting fact.